Triniti is a facial rejuvenation procedure, which is used for the eradication of wrinkles, age spots and photo damage from the face and to renew the facial skin. It includes three anti-aging technologies: FotoFacial RF Color correction, ReFirme Skin tightening and Matrix IR Fractional for Wrinkles. 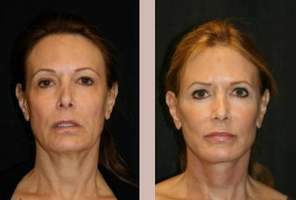 It is a less invasive and pain-free method when compared to other surgical methods of facelift treatments. The first procedure of FotoFacial RF color correction uses the radio frequency and pulsed light to heat the deeper layer of skin to enhance the tone, color and texture of the skin. The second procedure of ReFirme Skin Tightening is done to increase the production and bonding of collagen. Finally, Matrix IR Fractional for Wrinkles is aimed to stimulate the contraction of remodeling of collagen using intense fractional infrared light. It is comparatively a safer method with very few associated risks. However, it is advisable to educate yourself about the risks before deciding to choose this treatment. Minor discomfort is experienced due to the swelling and redness occurring after the treatment. A hot pinching sensation is experienced by almost all patients during this procedure. This may subside within hours after the procedure. Redness is not so conspicuous and can be easily covered by applying makeup. In few rare cases, swelling and redness can last up to few weeks and cooling lotions might be required to alleviate these risks. Although the laser lights used in the Triniti treatment are safe for most skin tones, they can deviate in rare situations. Dark skinned people especially have a potential risk of developing pigmentation after this treatment. Skin can either be hypo-pigmented or hyper-pigmented. Therefore, it is essential to perform a skin test before you go for this treatment. If you previously had many pigmented spots, then these spots might become darker and conspicuous after treatment. However, these darkened old spots will flake off within a week. This is another minor risk associated with this procedure of facial rejuvenation. Infra Red radiation may bruise the skin area where the treatment is performed. Generally, these bruises will subside within a week; however, if swelling is also noticed in the bruised area, then it can counteract the treatment as it stretches the patient's skin. Infection can rarely be noticed in the regions of treatment, which can be effectively controlled with antibiotic medication and topical ointments. Patients can experience extreme tenderness of skin in the treated area after the procedure. This tenderness will increase the sensitivity and pain in that area. In few extreme situations, ReFirme may cause extreme tightening of the treated skin area, and it may require weeks to recover. Few patients may need to apply topical lotions to get relief from this discomfort. Although this method is FDA-approved, it is important to discover if this treatment will suit your skin. Choose a certified and experienced cosmetologist for your Triniti treatment. Fix an appointment and discuss the pros and cons of this method and decide accordingly.